Barbara Ann, William, and Maysea. 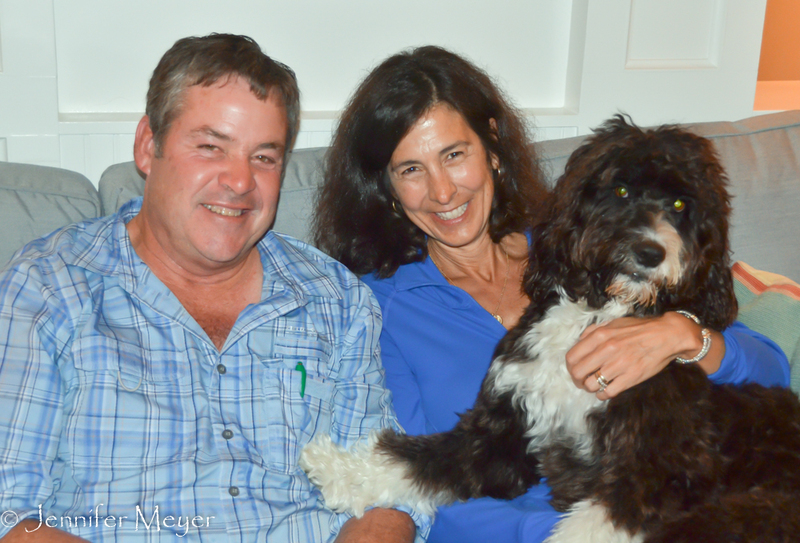 When we were camping in the Savannah Visitor’s Center parking lot a few weeks ago, I started up a conversation with another camper who was walking her very cute Portuguese water dog. Barbara Ann and her husband, William, were there just for the weekend, but in January, they’re going to launch their own year on the road. They’re in those final, exciting stages of preparation, getting their house in Panacea, Florida ready for renters while William ticks off his last days of work before retirement. They were eager to compare notes, but they needed to get on the road for the long drive home. Barbara Ann invited us to stop over at their place if we got to the Florida panhandle before they left. She said their driveway was plenty big enough for Bessie. She even sent me an email later with information about good beaches and things to do in the area. As it turns out, Panacea is not far off the path between New Orleans and Lake City, so when she insisted she really meant it, we took her up on it. We followed Barbara Ann’s suggestion to take Highway 98 south from Panama City, stopping at St. George Island for some beach time. It was a gorgeous day, and we reveled in the fact that we were warm and barefoot in white sand in December. The beach was almost empty, and Gypsy and Bailey could frolic freely, Gypsy chasing sand crabs, Bailey chasing balls. We arrived at their house at sunset, and they waved us into their driveway. They had a huge, beautiful house right on the water. Not only was there plenty of space for Bessie in their flat driveway, but they had full hook-ups, including 30-amp power and a place for us to dump our tanks before we left. We felt like we’d landed in a luxurious hotel for free. Dog fest on the beach. The next morning the weather turned gray and cool. 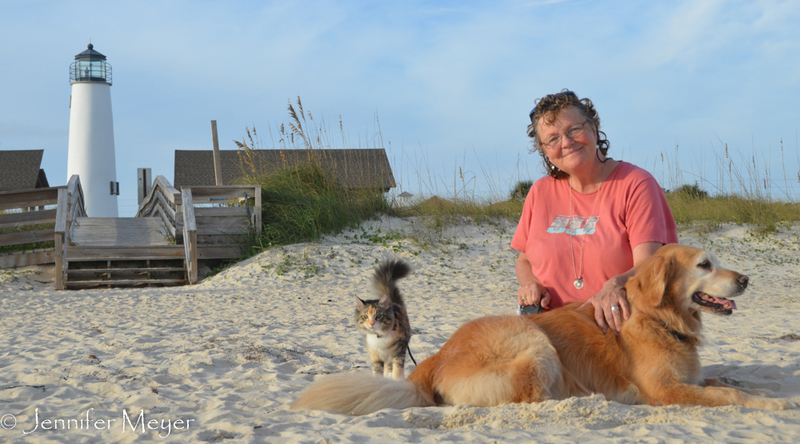 Barbara and I walked the dogs down to a quiet beach at the end of their street where she meets other neighbors every morning for a “dog fest” walk. 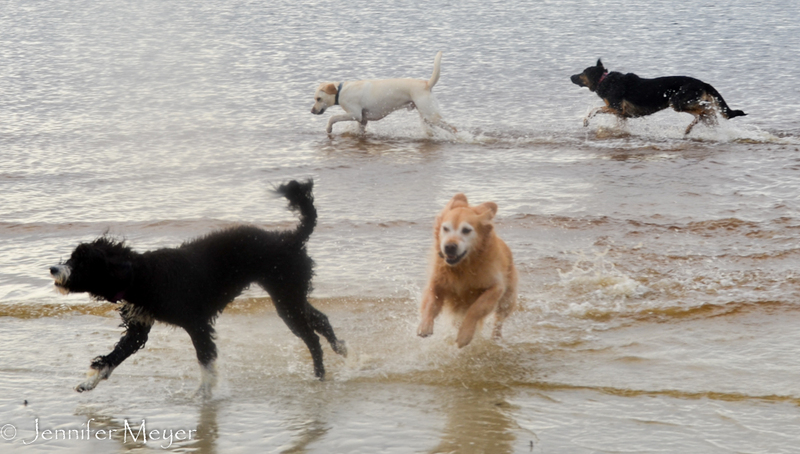 There were seven dogs in all, running wildly in and out of the water. They were all younger and friskier than Bailey, but she gave them a run for their money, grinning that famous retriever grin all the while. It rained that afternoon, and Kate and I enjoyed some quiet time in Bessie. But when William got home from work, we joined them for wine and cheese and they picked our brains for travel ideas. It was fun to talk to people on the verge of a similar adventure, and share experiences. Both Barbara Ann and William are just so likeable, and they were so generous to share their home with us, strangers from a parking lot. I truly hope we cross paths again while we’re both on the road. When we were driving from New Orleans to Panacea, we stopped at a rest stop for lunch, and when I stepped out of Bessie, I gasped, “Oh, my God!” Kate hates it when I do that. She thought our tow car had disappeared or something. 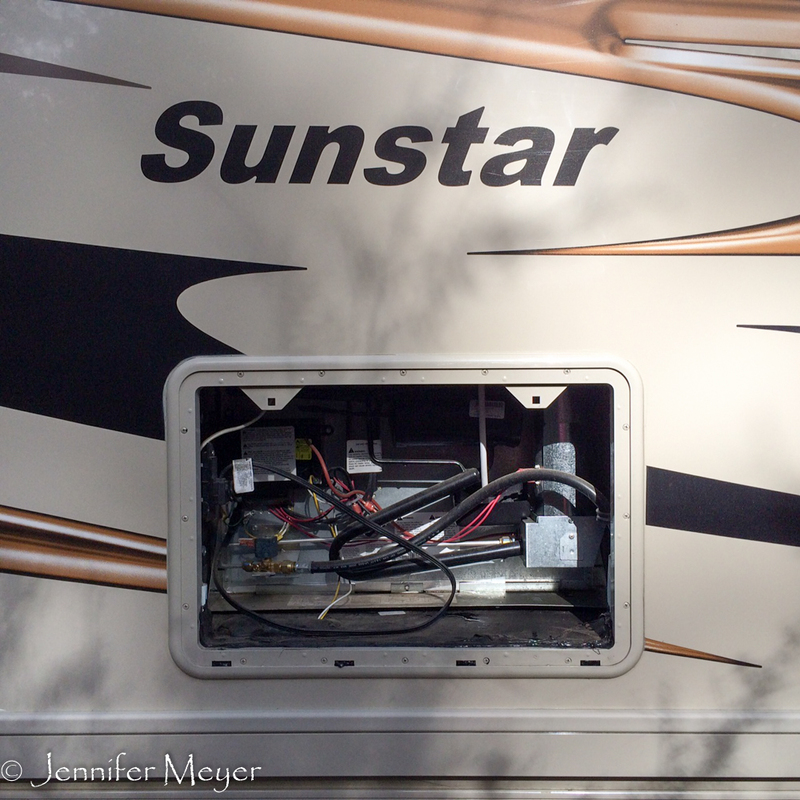 But it was just our refrigerator vent cover that was gone, leaving a gaping hole in the side of Bessie with wires and hoses. When we had been at Camping World in Lake City the week before, our service rep had taken that cover off to show me something and obviously had not put it on tight enough. It was smashed now, I imagined, somewhere on the shoulder of I-10. To protect the fridge’s inner workings, I fashioned a cover out of paper bags and duct tape. And when I called Camping World, they promised to get us a new one, which is no simple task since it’s painted and has decals. In the meantime, Bessie was looking a step down from fancy.